Concerns about environmental impacts of infrastructure systems are growing today. The life cycle CO2 emissions were studied for an antenna coated with HIREC and that with a snow melting heater system. 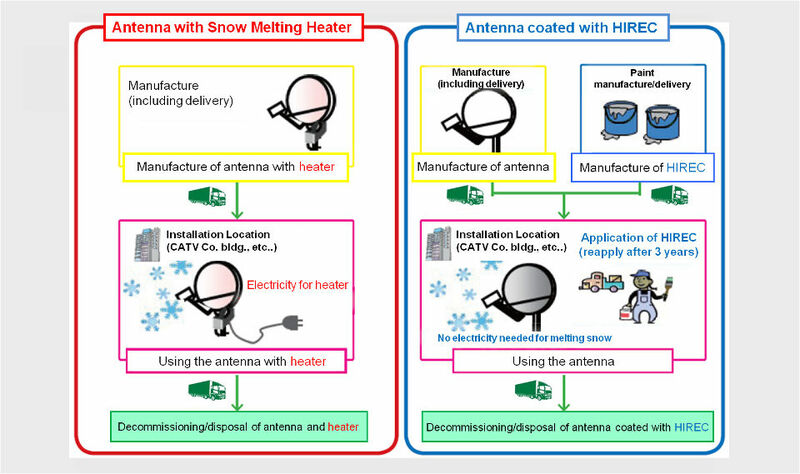 The assessment results show HIREC may reduce by almost 90% of life cycle CO2 emission of antennas comparing to that of conventional antennas with a snow melting heater system. Antennas set in the snowy area are equipped with a snow melting heater system in order to melt the snow and to prevent deterioration of broadcast reception. Antenna coated with HIREC prevents the accumulation of the snow and the formation of the water film. With HIREC the life cycle CO2 emissions of antenna can be reduce by about 90%. HIREC is an effective countermeasure for reducing CO2 emission.